Look at Plantronics’ online catalog and you’ll see a lot of commonplace products: Telephones, speakerphones, and a long list of headphones, earbuds and headsets for everything from music to gaming to telemarketing. But CTO Joe Burton thinks that the company needs to “shift to mobility … [and] away from normal phones.” It needs, he said, to make itself a competitor in wearable computing. I know; I was skeptical, too. Hang in there. As it turns out, even though “normal phones” are still its bread and butter, Plantronics has been experimenting for the past few years, loading its headsets with sensors like the ones you might find in a smartphone or, say, Google Glass. And with these sensor-laden hardware experiments, the company has been reaching out to third-party developers over the past few months through a secondary website, PLT Labs, to develop conceptual hardware and software. And some of these sensor-headsets are already out in the wild. At Cisco’s call center, Burton said, once a customer-support rep puts on a phone headset, a motion sensor registers that it is being worn, and the rep is automatically added to the call-routing queue. If near an active webcam, he or she is put in the special video-support queue. 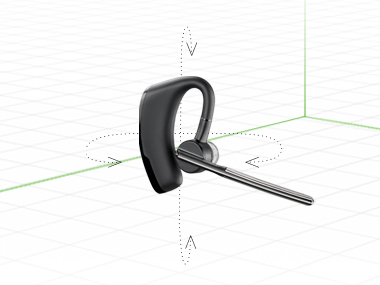 One of Plantronics’ internal experiments also piqued my interest. The company has hacked an Xbox to let the motions of a headset wearer leaning from side to side control a motorcycle racing game. In other words, Oculus Rift-esque motion tracking on a gaming console based on sensors connected to the body, rather than the one-step-removed Kinect camera. Rather than trying to solve consumers’ problems, the idea is that entertaining apps will validate new categories of devices for consumers, which you could argue was a big chunk of the mobile story, as well. Getting in front of games for devices like Google Glass may mean helping to figure out just what, exactly, a world of omnipresent games would look like. By contrast, Burton maintains that Plantronics’ chances at breaking into wearables may stem from the converse of that idea. That is, the company already has a history of convincing people to put stuff on their heads. He broke sensors down into four types: Near you (e.g., in your phone); on you (e.g., via a Fitbit clip); touching your body (e.g., an activity tracker on your wrist); and touching your head. But why separate touching your head from the rest of your body? Cynical answer: Because that makes Plantronics’ headsets seem automatically more sophisticated. Less-cynical counterpoint: Sensors on the wrist are good for health and biometrics, but the head indicates intent, Burton said. He speculated that retail stores might one day want to use wearables to figure out where on the shelf customers look, and how long they look there. “That’s frickin’ advertising gold,” he said. However, Burton acknowledged the “creepiness factor,” that “social acceptability runs in the other direction.” It’s easier to keep a watch-like activity tracker on the body at all times than to rationalize wearing smart glasses everywhere. On top of that, PLT Labs doesn’t have a clear road map for making marketable products … at least, not yet. “Our expectations are pretty open-minded right now,” Burton said, describing the concept-hardware side as taking a “kitchen-sink approach.” In the long term, the company will pick out the viable candidates for production based on both “volume and strength of demand,” he added.